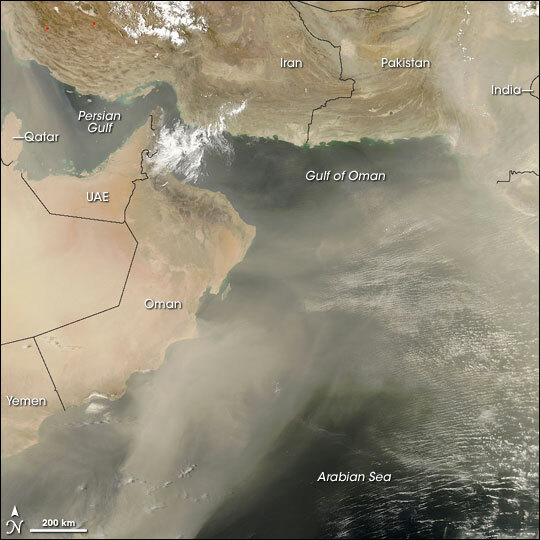 ARABIA-PAKISTAN DUST CLOUD NEWS - September 1, 2012. March 20, 2012 ... Islamabad : A major dust storm slammed Pakistan's Sindh, Balochistan and Khyber Pakhtunkhwa province, impacting flights and road traffic. June 9, 2012 ... Dust blows off the coast of Pakistan, near the border with Iran... The Indus River Valley is barely visible through the thick dust cloud. The Pakistani portion of the Arabia-Pakistan Dust cloud is weakening today. A lot of monsoon moisture is building up over India and is bumping up against the weakening wall of the Dust Cloud at the India-Pakistan border, so there should be a watch for parts of Pakistan to potentially receive from heavy rainfall to floods in the next 24-48 hours? Flash floods and torrential rains a possibility?